1 decides which player will cut by dribbling towards him, in this case he dribbles to 2 so 2 will cut and 3 will get a pass from 1. 2 will get 2 screens from 4 and 5 while cutting. After 2 has used the screen of 4, 4 will cut to the free throw line. 3 will pass the ball to 2 in the corner if he thinks 2 has a free shot or 2 and 5 can play a 2 men game. 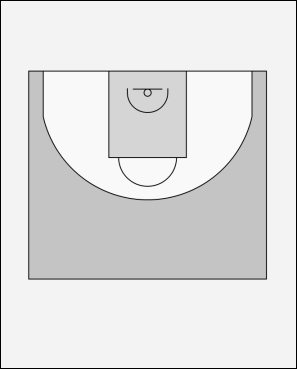 2 can also pass to 4, if open, who has flashed to the corner of the free throw line. If 3 doesn't pass the ball, he gets a screen of 4 (who continued moving) and dribbles towards the free throw line. If 3 is open he can go for the basket. Otherwise he can pass to 1 who is open. 1 can pass to 4. If no options appear, 4 and 5 will set screens for the cutting 2. 2 should time its cut so he arrives a second after 4 has reach his blocking position. 5 flashes to the free throw line and 3 gets open on the other side of the court. 2 can make a shot, penetrate to the basket of pass to the flashing 5.